When searching for the best cloud applications for your business, choose the app for the task at hand. Businesses often take their first steps onto the cloud in a piecemeal fashion, with first one cloud app and then another. However, because these integrations can often happen in the pressure of the moment rather than after considered and deliberate decision making, some businesses find themselves with a sprawling network of cloud-based services, some of which are redundant, and some which may not fit the task. 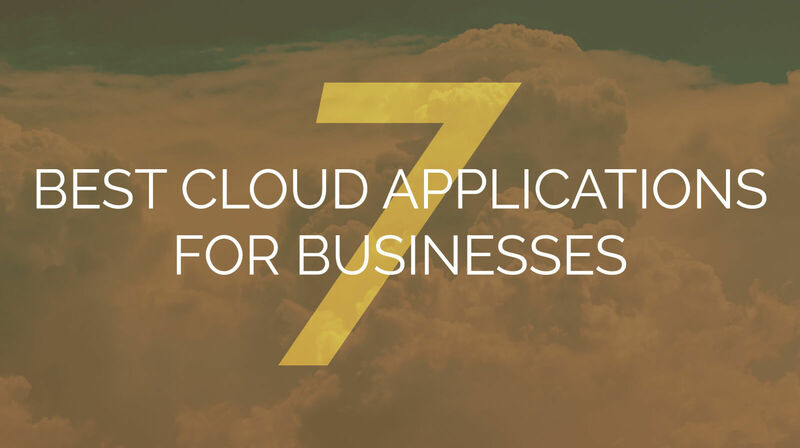 In order to find the best cloud applications for your business, it’s important to look at what tasks you need to accomplish. If you need a robust sales tool, piecing together a number of smaller, cheaper applications won’t be as effective as a more comprehensive solution. On the other hand, if you only need your app to accomplish one task, there’s no need to over-invest in a more robust application. To help you find some of the best cloud applications, here are a few broad categories many of the top services fall under. 1. Communication: Team messaging and video conferencing. Cloud-based communication programs cover a wide range of services, from project management to video conferencing. One of the most revolutionary apps in this filed has been Slack, which practically dominates the industry for text-based group messaging. However, for video conferencing applications such as Google Hangouts, GoToMeeting, and join.me have been more effective. Hangouts is the most light-weight of these options, and is convenient in that users only need a Google account to join. Join.me is a mid-sized option which offers a few more features, including more stable connections for larger groups. Finally, GoToMeeting offers a broader toolset for larger businesses who frequently have recurring video conferences with members around the globe. 2. Cloud Storage: Drives and hosting. Cloud storage allows users to access their files at any time, from any device. It’s especially crucial for file backups and for helping groups stay coordinated. However, the larger your files are, the more storage you will need to pay for. For businesses with mostly text documents, Google Drive is an accessible cloud storage solution. Amazon and Microsoft have storage solutions (Amazon Drive and OneDrive respectively) that can be effective for users who rely on their product suites. Finally, Box has become a major market contender in recent years with a wider range of tools that integrate well with many other software services. 3. Marketing: Email, social, and automated tools. Most marketing departments, particularly those focused on digital marketing strategies, operating without cloud-based tools is basically impossible. Some of the most popular tools for small businesses include email managing tools such as MailChimp, and social media scheduling tools like Hootsuite. Some programs, such as Coschedule, offer a combination of these programs, along with options that allow synchronization with other popular marketing applications. 4. Sales: Customer Relationship Management (CRM) software. That said, marketing automation and sales often blend together in the sphere of cloud application software. Nowhere is this more apparent than with Customer Relationship Management software (CRMs). These cloud applications identify visitors using browser cookies, then track their behavior to better target marketing materials and cultivate sales leads. The industry leaders in this field is unquestionably SalesForce. However, as a large platform with a lot of functionality, it can quickly become overwhelming for small businesses. HubSpot, another well-know brand in the CRM and marketing automation field, is more manageable with SMBs, as is SharpSpring. 5. Website: Content Management Systems (CMS). These days, almost all websites are built using a cloud-based Content Management System. The most popular by far is WordPress, which powers approximately a quarter of the Internet. However, other popular CMSs include hosted options, such as Wix and Squarespace, or open-source platforms such as Drupal and Joomla. These services make it easier for businesses to edit and update their websites, without needing to know any coding. As such, they are a powerful tool to help businesses represent their brands. 6. Accounting: Billing, invoicing, and time tracking. Cloud-based accounting tools have helped many small businesses create and send invoices more efficiently, log expenses, and track time. FreshBooks and QuickBooks are at the top of the list, particularly for small businesses. With options to track time logged by project, client, and task, it helps organizations manage their time on projects more effectively, as well as track how employees are using their time during the day. This in turn helps businesses learn how their resources are being spent so that they can create better project estimations. 7. Software Suites: Software application packages. Finally, many software brands have switched to cloud-based subscription packages rather than the license model they used to run on. By charging a monthly subscription fee, they can bring in users who otherwise couldn’t afford the up-front cost of the full software package. This also lets them offer related cloud storage services for files creating using their products. The Google application suite, including Drive, Docs, Sheets, Gmail, Hangouts, and more, is one of the most widely-used among small businesses. These services mirror the programs Microsoft offers with OneDrive, Word, Excel, Outlook, and Skype. Finally, Adobe offers a Creative Cloud service which links with its desktop apps to improve team coordination. For a more integrated approach, private cloud is also an option. Cloud applications can be a great boon to businesses in terms of improved productivity, communication, and backups. But managing numerous apps from a browser can be confusing, and sometimes the program you want to use doesn’t have a cloud counterpart. Fortunately, there is an option for businesses who want to run their desktop applications in a cloud environment: a virtual desktop using a private cloud. With a virtual desktop, users don’t just log in to an application, they log in to the entire work environment. They can log out of their work computer, then log in to a laptop or home work station and find all their files as they left them. While many businesses may still rely on other cloud apps for certain functions (marketing automation, for instance), private cloud can improve the overall accessibility of their data, as well as aid in backup and recovery services. Brightline Technologies offers a proprietary private cloud environment for businesses who would like to take advantage of a virtual desktop. To learn more about how your team can benefit from these services, contact us today. « Brightline Technologies, Inc. Has Been Named One Of Metro Detroit’s Best And Brightest Companies to Work For® In 2018!